Cliffside Slide is the sixth level of Donkey Kong Island in Donkey Kong Country: Tropical Freeze, and it is the final silhouetted level in the game. 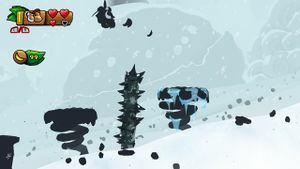 The level is reminiscent to the Cliff levels of Donkey Kong Country Returns, however, the area is covered by a blizzard, due to the influence of the Snowmads. 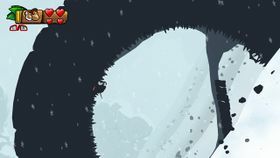 The prehistoric bones and cliff-sides from the Cliff levels of Donkey Kong Country Returns can be found throughout the background and as silhouettes in the foreground, but they are covered in ice and snow. Many platforms in this level are suspended from the snow that pours down the slope. The Kongs also must be wary of platforms, particularly bones, that break from their weight. In the second half of the level, they must progress up the mountain through the use of platforms that rise and sink from the snow, as well as flower trampolines, vines, and a few Barrel Cannons. Toward the end of the level, the slope becomes much steeper, and the Kongs must climb through use of crumbling wooden platforms. Common enemies along the way include Tucks, Archies, Big Sphens, Walnuts, and Hootzes. The music selection for this level is entitled "Snowmads Theme." The beginning of the level leads past a few enemies, such as a Waldough and a Pointy Tucks, and then to a Barrel Cannon suspended over a pit. A Puzzle Piece is located in an alcove, hidden behind wooden planks. The Barrel Cannon shoots the Kongs into an area where they must climb up the mountain by use of tilting platforms, which are shaken by the avalanche. The letter K is found in this section above two Pointy Tucks. After the Kongs pass a fire-shooting Archy, another Barrel Cannon is placed to launch them ahead into another Barrel. Two Blue Hootzes circle through the area that the Kongs must shoot through, so they must watch their timing. Afterwards, they land in an area consisting of two trampoline flowers that are followed by a large structure made from wood and bones. Donkey Kong and the gang must travel quickly to the nearby Barrel Cannon, or else the structure will sink into the snow. On the way to the barrel, a few Tucks enemies stand in the way. The Barrel Cannon, and the one following it, shoot the Kongs to the first checkpoint, located on solid ground. Ahead, the first DK Barrel in the level lies after a small gap of spikes, and the barrel can free one of the three other Kong characters: Diddy Kong, Dixie Kong, or Cranky Kong. The path ahead lies on a long and solid wooden structure. Here, a Big Sphen can be found guarding an alcove with a Puzzle Piece. Another Big Sphen is placed ahead of the letter O, which is surrounded by two spiked ceilings. This means that the Kongs cannot jump over the Big Sphen's ammunition while under the spiked ceilings, as doing so will send them into the spikes. A Barrel Cannon ahead shoots to an area of more small platforms and flower trampolines suspended over the avalanche. Some of these platforms crumble or sink moments after the Kongs stand on them. Enemies in this section include Tucks and a fire-shooting Archy. Eventually, the Kongs must climb a vine ceiling to advance to addition platforms. The structure with these vines holds a plant with a Puzzle Piece in it. A dinosaur skull also lies ahead of here, and if stood on for too long, the upper jaw crumbles and can damage the Kongs. The skull is followed by a series of swinging vines, which lead to a Barrel Cannon. The letter N is also in this area, suspended above a Hootz. The two Barrel Cannons ahead of here shoot to the second checkpoint. The Kongs climb a rounded vine wall. A second DK Barrel, which includes all three Kong characters, is located ahead of here, where the Kongs travel along a solid, wooden structure with many spikes along it. The Kongs are able to find a Puzzle Piece enclosed in a plant by climbing to a ledge, which can be reached by jumping on a Hot Hootz. After passing a Chum Chucker Charlie, the Kongs can find a Barrel Cannon, which shoots them to a steeper section of the mountain. As they are launched over the abyss, a massive stone fortress crumbles in the background. In this steep section of the mountain, Donkey Kong and the gang must utilize the wooden planks suspended over the avalanche to climb upwards. Additional planks fall toward them as they continue up the slope, and some of the planks break when stood on. A Puzzle Piece is located in a plant towards the top of the area, where the letter G is suspended over a fire-shooting Archy. A Barrel Cannon nearby also shoots the Kongs to a higher section, where they must again use wooden planks and flower trampolines to progress upwards. Two Hootzes must be used here to bounce to the next Barrel Cannon. This cannon shoots to a section where the platforms are also occupied by Archies. After passing these enemies and moving ahead, the Kongs enter a series of Barrel Cannons that lead them to a huge, curved wall of vines. The vine structure sinks and crumbles as they climb, so they must quickly advance to the nearby Barrel Cannon. A spiked wheel travels along the vines, but they can knock it off by pounding on the vines. The Barrel Cannon shoots them the remaining distance up the mountain and through a large cloud. Once they exit the cloud, another cannon shoots them to a platform with a small handle on it. The Slot Machine Barrel appears when the handle is pulled. The third Puzzle Piece is located in this plant. K: At the beginning of the level, the Kongs shoot to an area with platforms that sink into the snow. In this area, they can find the letter K above a platform with two Tucks. O: After passing the first checkpoint, the Kongs can find the letter O under a wooden ceiling. Dixie Kong can fly to it with her helicopter hair, or Donkey Kong can jump on the fish being shot from a nearby Big Sphen. N: The letter N can be found shortly before the second checkpoint. The Kongs can collect it while swinging on vines. 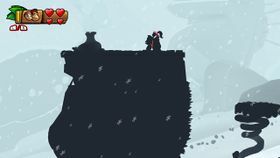 G: Toward the end of the level, the letter G is located in the first section where the Kongs must climb up crumbling wooden platforms brought down by the snow. It can be found at the top near a Barrel Cannon. The first Puzzle Piece is located at the beginning of the level in an alcove. It is hidden behind wooden planks that disappear once the Kongs enter the alcove. After passing the first checkpoint, the second Puzzle Piece can be found in an alcove behind a Big Sphen, who stands on a high ledge. The Puzzle Piece must be released from the ground by pulling a handle. Before reaching the second checkpoint, the Kongs climb a vine wall over the avalanche. The Puzzle Piece is located within a plant, which grows on top of the structure holding the vine wall. A Hootz is located to the left of the second DK Barrel. By jumping on it, the Kongs can reach an alcove that contains a plant. A Puzzle Piece is inside the plant. The fifth Puzzle Piece is located in the same area as the letter G. It is hidden inside a plant, and the Donkey Kong can open the plant by pounding on it. The area at the beginning of the level. The platforms tilt under the impact of the avalanche. The Kongs stand near a Chum Chucker Charlie. The platforms in this area crumble if the Kongs remain here for too long. This page was last edited on April 15, 2019, at 12:44.